Published by C.C. on March 28, 2008 in eMC and News. 17 Comments Tags: eMC, Masta Ace, Punchline, Stricklin, The Show, Wordsworth. 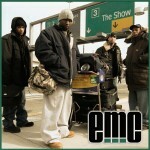 EMC’s brand new album the show is available in stores and on iTunes. You know about EMC, but the record store in your city probably doesn’t. Help us get the word out! Go to the record store(s) in your Neighborhood, Town, City and speak to the manager or music buyer. Tell him or her to please order the CD EMC “The Show”. Thanks for your loyalty and support. POSTED ON March 28, 2008 BY C.C. FILED UNDER eMC and News Tags: eMC, Masta Ace, Punchline, Stricklin, The Show, Wordsworth.